One of the first things that comes to mind when someone is faced with following a wheat-free diet is what to eat for breakfast. Many breakfast cereals are wheat-based, and if you’re a cereal eater, that can be tough to swallow. Fortunately, some well-known cereals are naturally wheat-free, and many other manufacturers are now making cereals without wheat, so there are many good options available. Several of the cereals that you grew up with are made exclusively from oats, corn or rice. You should always check the label, just in case their formulation has changed, but Kellogg’s Rice Krispies, Kellogg’s Cornflakes, General Mills Kix and General Mills Chex cereals -- except for Wheat Chex -- have traditionally been made without wheat. Many Quaker cereals, including oatmeal varieties, grits and Quisp, are also wheat-free. If you need to follow a gluten-free diet, it’s important to note that many cereals can be wheat-free but still contain gluten from other ingredients, additives or cross-contamination with wheat. Small family-owned food manufacturers often provide a wider range of allergen-free and all-natural cereals. Nature’s Path produces organic cereals, many of which are designed for special diets. The company offers several that are wheat-free, including Whole O’s, Jungle Munch and Mesa Sunrise Flakes with Raisins. Barbara’s is another small manufacturer that produces many products, including cereals, for special diets. Their wheat-free cereals include Puffins, Honest O’s and Cornflakes. While wheat, corn, rice and oats are commonly used to make cereal, ancient grains such as quinoa, amaranth and millet are another cereal-like option. They’re not related to wheat, so it's safe to eat them if you are on a wheat-free diet. Several manufacturers, such as Bob’s Red Mill, sell packages of plain grains that you can cook and combine with milk, fruit and nuts to make your own hot or cold cereal. Arrowhead Mills is another small organic manufacturer that makes cold cereals from ancient grains. Its cereals include Amaranth Flakes, Maple Buckwheat Flakes and Puffed Millet. If you follow a wheat-free diet because of a food allergy or a food intolerance, it’s important to read the food label each time you buy a product because recipes and formulations can change without notice. Fortunately, because wheat is a major allergen, the Food Allergen Labeling and Consumer Protection Act requires that all food products that contain wheat clearly list it on the food label. Occasionally, wheat-free products might be manufactured in a facility that also produces wheat-based products, so there might be cross-contamination. It’s up to manufacturers to decide if they want to list this information on the label because there are no laws about including precautionary statements. 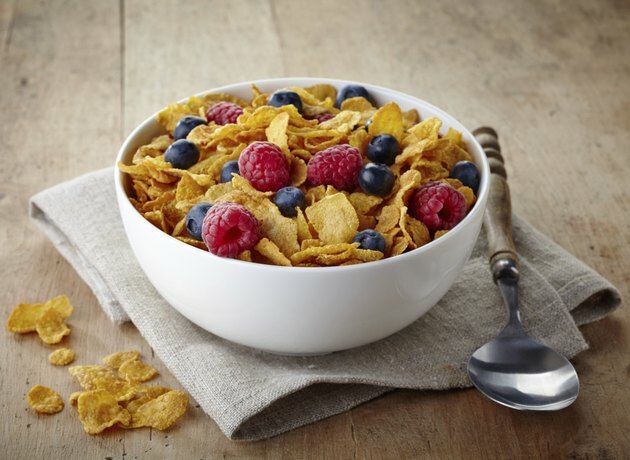 Does Kellogg's Corn Flakes Contain Gluten? What Foods Don't Contain Wheat & Gluten?